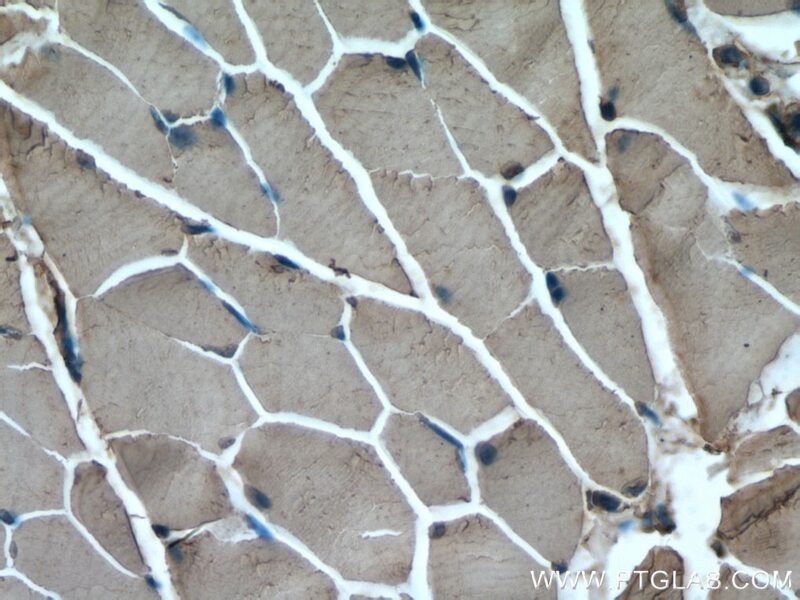 Immunohistochemical analysis of paraffin-embedded mouse skeletal muscle tissue slide using 23016-1-AP (Nav1.5 antibody) at dilution of 1:200 (under 10x lens) heat mediated antigen retrieved with Tris-EDTA buffer(pH9). 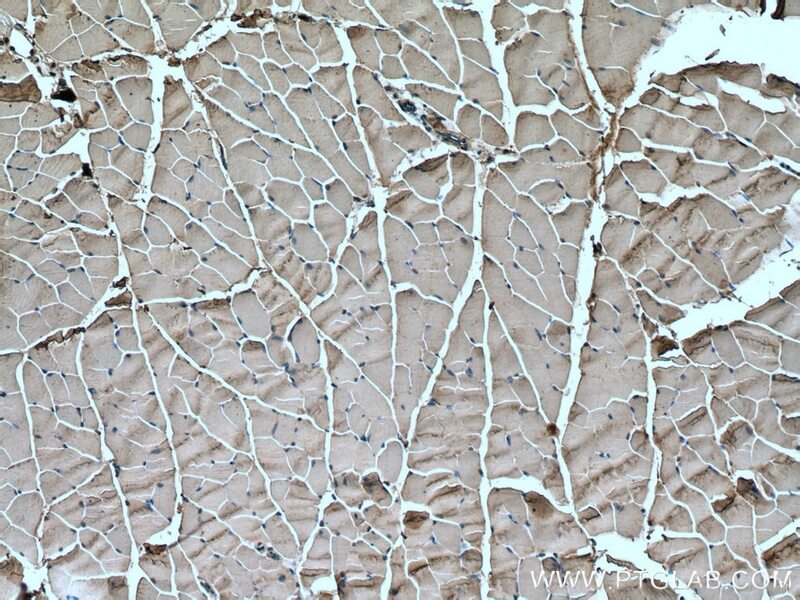 Immunohistochemical analysis of paraffin-embedded mouse skeletal muscle tissue slide using 23016-1-AP (Nav1.5 antibody) at dilution of 1:200 (under 40x lens) heat mediated antigen retrieved with Tris-EDTA buffer(pH9). Voltage-gated sodium channels are responsible for initiation and propagation of action potentials in the membranes of neurons and most electrically excitable cells (PMID: 10798388). These channels are composed of a large alpha subunit that forms the ion conduction pore and auxiliary beta subunits (PMID: 11486343). The alpha subunits form a gene family with at least 10 members. Nav1.5, encoded by the SCN5A gene in humans, is a pore forming alpha subunit of voltage-gated sodium channels. Nav1.5 is the principal Na+ channel isoform expressed in cardiomyocytes. Mutations in SCN5A gene have been linked to many cardiac electrical disorders, including the congenital and acquired long QT syndrome, Brugada syndrome, conduction slowing, sick sinus syndrome, atrial fibrillation, and dilated cardiomyopathy (PMID: 23123192). Mechanistic insights into the interaction of the MOG1 protein with the cardiac sodium channel Nav1.5 clarify the molecular basis of Brugada syndrome. Scorpion Venom Analgesic Peptide, BmK AGAP Inhibits Stemness, and Epithelial-Mesenchymal Transition by Down-Regulating PTX3 in Breast Cancer.